Road brings you plain blue stripes paper bags that are great DIY and craft bags.They are great gift and favor bags for parties, marriages, baby showers, birthdays, anniversaries, festivals, etc. Since they are not printed so you can personalize them with your own message or design. The thick paper bags can be painted, stamped, inked, printed and embellished in any way you please. They make a good creative activity for kids who can decorate the bags with flowers, paper cut-outs, buttons, sequins, ribbons, etc. Buy these bags with the knowledge that they will not harm the planet in anyway. These bags are completely biodegradable, can be composted, recycled and reused. The storage paper bags are great for storing clothes, papers, cosmetics and a whole load of other things. The bags are designed like a tall box with a flat bottom that is gusseted for strength. They can stand free and are very easy to load. The wide top opening allows you to put even large items such as a salad bowl in it. Strong bottom and tightly sealed sides make it a very strong and sturdy bag. The thick kraft paper that is used to make the bags is very strong and can take at least 1.5 kg of weight. Each pack contains 50 premium Blue stripes Kraft paper bags. Buy your supply of bags now for same day shipping. 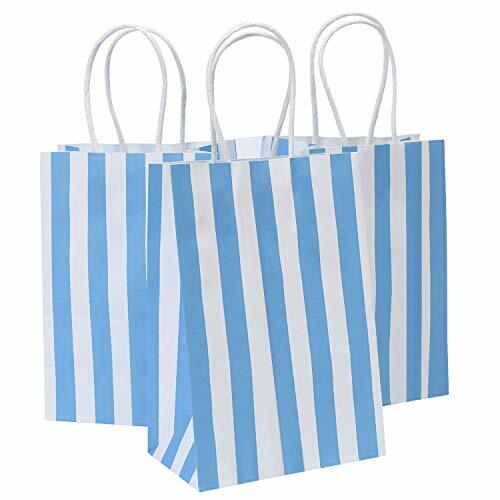 ✔Strong and Versatile Bags: They are strong and sturdy paper bags that can carry at least 3lbs of weight easily.These bags are made with thick plain blue stripes kraft paper and have a strong rope handle. The box type bags have a flat bottom so they can stand well. ✔Multipurpose Paper Bags: Size: 5.25x3.25x8 inches, Road plain small paper bags can be used for a variety of purposes. Road kraft paper bags should be your first choice. ✔Durable DIY Paper Gift Bags: These bags are perfect for craft and DIY. They are plain blue stripes and can be painted, printed and embellished as you may wish. Print your own business logo and use them as retail carry bags.Personalize the bags to make them uniquely yours. ✔Sturdy Handles: They do not come off like handles on other bags.Road kraft paper bags have handles that are attached well to the bags.All the seals on the bag are very strong and do not open up or rip apart easily. Large opening allows for keeping large items. ✔Eco-friendly Bags: Road bags are made with an eco-friendly biodegradable material. These bags can be recycled, reused and composted. Road bags come with our 100% satisfaction guarantee. If you are not happy with the product, return it for an exchange or a refund. Get your pack of 50 bags now! If you have any questions about this product by Road, contact us by completing and submitting the form below. If you are looking for a specif part number, please include it with your message.